Ulster's Andrew Trimble scored two tries in Saturday's win in Italy. Last week I urged for a guarded optimism after Ulster walloped Cheetahs 42-19 in their opening Guinness PRO14 match in Belfast. And that is where I still am after round two when Ulster held out to defeat Benetton Rugby 21-14 in Italy. It cannot be missed that Les Kiss’s side have won two from two. And winning on the road did not come often last season - let alone picking up try scoring bonus points. However, the fashion of Ulster’s victory in Stadio Monigo was disappointing. Having raced into a 14-0 lead in the front quarter and then to have gone 21-0 ahead in the second half having weather a bit of a Benetton comeback Ulster should have gone on to finish the job. Instead they were left holding their lines as the Italians pushed to salvage a draw from the game. Ulster lacked the directness they had the previous week against Cheetahs, their execution at times was poor and there was not the same go forward as the previous week. Marcell Coetzee, who did not travel as he continues to reach match fitness, was badly missed. Jean Deysel may have been given the man of the match award the previous week - but he needed his South African stablemate with him in Italy. That lack of ball carrying hurt Ulster at times, particularly in the second half. The accuracy let them down across the field at times as well. However, Andrew Trimble’s two tries in the first half came off some breathtaking handling. Trimble made his 218th appearance and captained the side - 12 years to the day the Irish international winger made his debut in the white jersey. Scrumhalf John Cooney picked up the Guinness man of the match award with another confident display. His charge down which eventually led to the third try - reminded you of what Ruan Pienaar did when he was with Ulster. But without that go forward ball Ulster had enjoyed the previous week Cooney and halfback partner Christian Leali’ifano were unable to dictate things as they would have liked. When both were pulled ashore, Ulster needed a Paul Marshall off the bench. 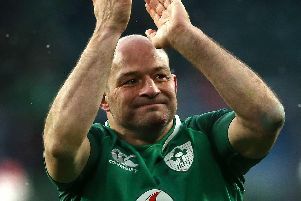 Yes he may get a bad press occasionally, but he was the type of player needed to shake things up a little, doing something unexpected rather than Dave Shanahan shuffling ball continually from the back of a scrum or ruck. When the Ulster backs did have the ball they looked good, so it was somewhat disappointing to see so much kicking back and forward at the start of the second half. There were obviously some close calls on forward passes during the game, some marginal and had they swung the other way it would have been a different story for Ulster. However, as I discussed with radio presenter Ivan Martin on U105 yesterday morning, perhaps we are expecting too much from Ulster. Better markers can be made after the visit of champions Scarlets to Belfast on Friday night and at the end of the first set of matches in this block of PRO14 games ahead of the European Champions Cup openers. p It may be a new look PRO14 with the revamped Championship, but the usual suspects are top of the respective sections. The sides usually at the top are pushing on already and the strugglers, joined this season by the new South Africans are still lagging behind. Except for Edinburgh who are this season’s dark horses - Richard Cockerill having an influence already?